PopularMechanics.com : From the first time Christian children settle into Sunday school classrooms, an image of Jesus Christ is etched into their minds. In North America he is most often depicted as being taller than his disciples, lean, with long, flowing, light brown hair, fair skin and light-colored eyes. Familiar though this image may be, it is inherently flawed. A person with these features and physical bearing would have looked very different from everyone else in the region where Jesus lived and ministered. Surely the authors of the Bible would have mentioned so stark a contrast. On the contrary, according to the Gospel of Matthew, when Jesus was arrested in the garden of Gethsemane before the Crucifixion, Judas Iscariot had to indicate to the soldiers whom Jesus was because they could not tell him apart from his disciples. Further clouding the question of what Jesus looked like is the simple fact that nowhere in the New Testament is Jesus described, nor have any drawings of him ever been uncovered. There is the additional problem of having neither a skeleton nor other bodily remains to probe for DNA. In the absence of evidence, our images of Jesus have been left to the imagination of artists. The influences of the artists' cultures and traditions can be profound, observes Carlos F. Cardoza-Orlandi, associate professor of world Christianity at Columbia Theological Seminary in Atlanta. "While Western imagery is dominant, in other parts of the world he is often shown as black, Arab or Hispanic." 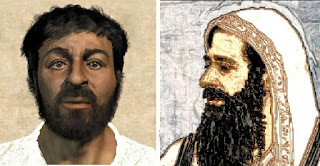 And so the fundamental question remains: What did Jesus look like? An answer has emerged from an exciting new field of science: forensic anthropology. Using methods similar to those police have developed to solve crimes, British scientists, assisted by Israeli archeologists, have re-created what they believe is the most accurate image of the most famous face in human history.